The healthcare management and administration field is growing rapidly, and an increasing number of people are entering the field. If you’re considering entering this profession, there are specific qualities and interests that would make you an ideal candidate. Due to the amount of transition that this industry is undergoing, it is a challenging time to be a healthcare executive; however, the field also offers one of the highest rates of job satisfaction. An excellent leader must understand the reason behind why their organization exists, in addition to its overall goals. With this understanding, a healthcare admin must be able to align their organization’s priorities with realistic economics. It can be difficult to remain accessible and open, specifically with tough solutions or difficult issues; however, a leader must be able to speak openly and honestly regarding pressing issues with the employees he/she oversees. Successful administrators must ensure that their systems and employees are evaluated and held to professional standards. Without measuring whether or not their employees are meeting established benchmarks, there is no way to gauge if they are achieving success and progressing forward. Moreover, an administrator must ensure that he or she has individuals who will hold them accountable for their decisions. Healthcare organizations have a tendency to involve complex political environments. This type of challenging work environment demands that a leader be able to make deliberate, comprehensive, and sound decisions. Indecisiveness can quickly derail the best laid plans, as can hastiness and jumping the proverbial gun. In the healthcare industry, it is vitally important to establish and foster professional relationships, and having excellent communication skills is an important component of achieving this goal. While it sounds deceptively simple, the importance of having communication skills cannot be stressed enough. An admin must ensure that their constituents understand the vision the admin has and what their specific expectations are. There is no room for ambiguity. The healthcare industry is currently undergoing critical changes right now. In particular, the field of information technology is revolutionizing decades old healthcare practices. 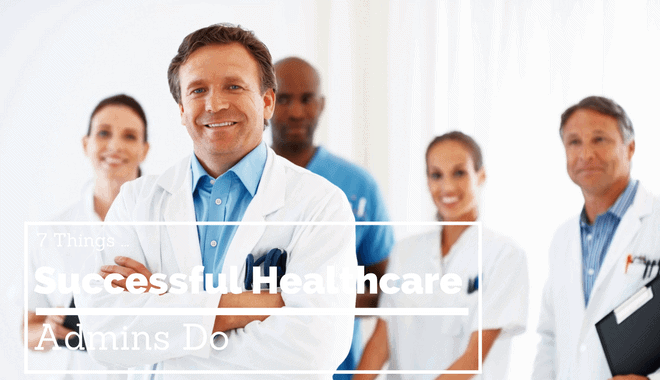 A healthcare administrator must be able to embrace IT and the latest technological advancements with open arms. In doing so, they will be bettering their employees, partners, and most importantly, their patients. The ability to adapt is crucial. In other words, don’t overlook the little people. Making employees feel valued may seem less important than expanding the neurology wing of the hospital or merging with another hospital; however, when employees feel appreciated, they are much more likely to do their jobs well and follow their organization’s “best practices”. They are also significantly less likely to leave their jobs, which saves a hospital the expense of having to hire and train new employees. If you are serious about entering the field of healthcare administration, you must always remember that your organization should be treated as a reflection of yourself – in both the positive and the negative. If your employees are unhappy, or your hospital is financially struggling, evaluate your own actions and leadership before blaming others. On the other hand, if your hospital is thriving, take pride in what you have accomplished.